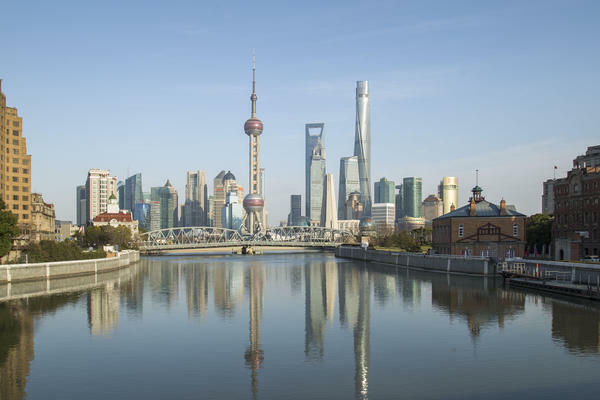 The twisting Shanghai Tower (right) is the world's second-tallest building and opens soon. 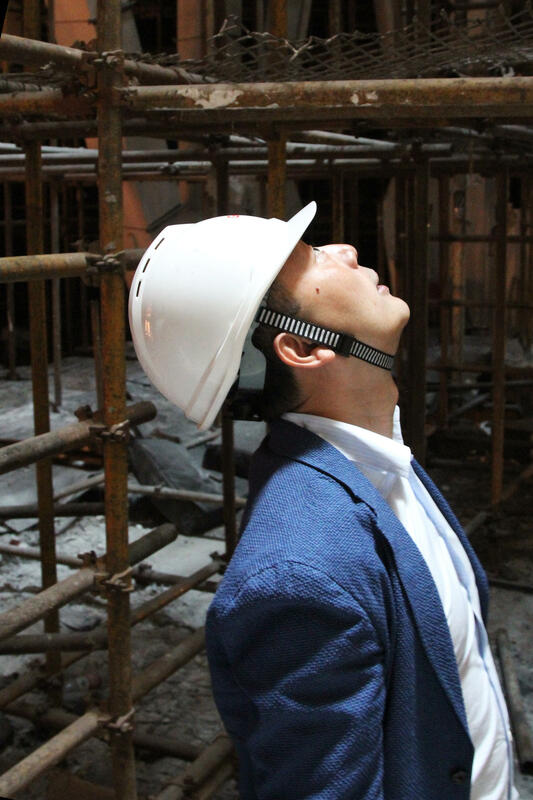 Jun Xia, an architect and Shanghai native, gazes up at a circular opening in the roof of Shanghai Tower. The architects hope to create "a vertical urban community" with the new building. It's estimated 20,000 to 30,000 people will pass through Shanghai Tower each day. Shanghai is one of the world's most vertical cities, a metropolis where 50-story buildings are routine. At night, the cityscape is so cinematic, it has been featured in both James Bond and Mission Impossible films. This year, Shanghai Tower, the world's second-tallest building, will open and put an exclamation point on Shanghai's futuristic skyline. The structure, which measures 2,073 feet, is loaded with symbolism. It rises out of Shanghai's riverside financial district, which as recently as the 1990s was a mix of warehouses and open fields, even home to a dairy farm. The tower twists and tapers like a glass and steel geyser hurtling toward the sky — illustrating both Shanghai's and China's ambitions. The building is so tall, only the Burj Khalifa (2,717 feet) in Dubai is taller, that the views can be disorienting. From an observation deck on the 120th floor, visitors can stare down about 600 feet to a neighboring skyscraper, the Jinmao Tower. By comparison, the Jinmao, which opened in 1999 and resembles a pagoda, is taller than the Empire State Building. 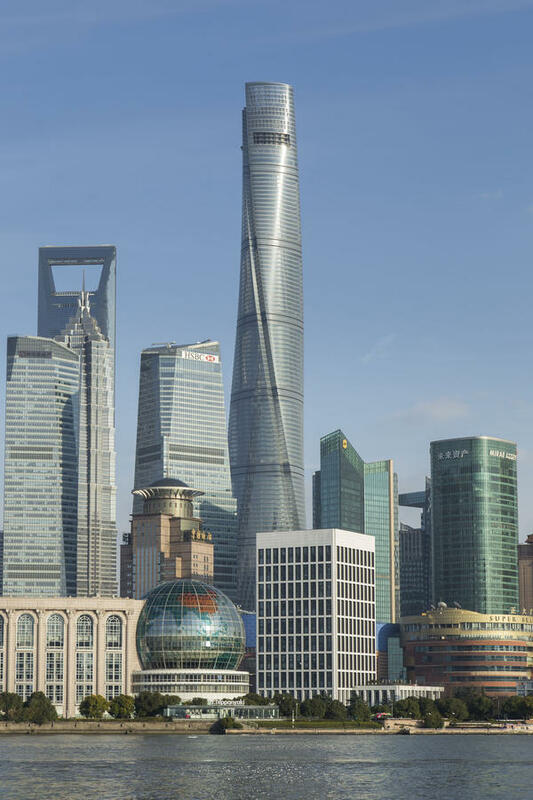 On a clear day, you can see more than 30 miles from Shanghai Tower to the East China Sea, says Jun Xia, a Shanghai native and regional design director for Gensler, the American firm that designed the building. To prevent the building from swaying in heavy winds, workers used a crane to stack steel plates and build a 1,200-ton, tuned-mass damper near the top of the tower. The damper is computerized and surrounded by pistons, which push it in the direction of strong winds to counterbalance their force. Without a damper, the top of the building could sway as much as 5 feet during typhoons, says Daniel Winey, Gensler's managing principal for the Asia-Pacific region. "If you don't have something like this in a building of this height, you can actually get nauseous," says Winey. Beyond its height, what distinguishes the structure is its design. Shanghai Tower is a building within a building. The interior — where offices and a hotel will be located — is a cylinder wrapped in a skin of glass and steel, which creates a series of atriums that run up the sides of the structure. An atrium on the eighth floor is a dozen stories tall and has palm trees, granite benches and a panoramic view of the city. "It creates what we call a vertical, urban community," says Xia. Once the building is completely open, 20,000 to 30,000 people will pass through each day, says Winey. People can have lunch, grab a coffee or hold meetings in the atriums, called sky lobbies. Winey says the sky lobbies should offer enough amenities that some people won't feel compelled to leave the building during the workday, which will save on elevator rides and electricity. "It's really more a study in urbanism than anything else," says Winey. "It's taking the ideas of Shanghai, where you have all these little parks and neighborhoods, and (turning it) from a horizontal plane to a vertical plane." In all, there are 21 sky lobbies — that's not a typo — which are mostly public space that can't be rented out to make money. Winey says these sorts of design elements ensure a building like this would never be constructed in the United States, because the return on investment would be a long way off. "From an economic standpoint, it would never pencil out," he says. "I don't think there would be any U.S. developers who would make that kind of investment." Shanghai Tower, though, isn't a conventional investment. It was built for about $3 billion by the Shanghai Tower Construction and Development Co., a state-owned enterprise. The company declined an interview request from NPR. The structure, which is ultimately owned by the city, is more than a building. It's a statement, an anchor for Shanghai's showcase skyline and a symbol of China's economic rise. From the government's perspective, given the message it's trying to send to Chinese people and the world, the money is probably worth it. Shanghai Tower's reign as the world's second-tallest building, though, won't last long. Ping An Financial Center in the southern Chinese city of Shenzhen will surpass it when it opens next year. Yang Zhuo contributed to this article. Shanghai is one of the world's most vertical cities, and this year it's becoming even more so. A new skyscraper - the world's second-tallest - is opening. It's called Shanghai Tower. It's more than 2000 feet tall, an exclamation point to Shanghai's futuristic skyline. NPR's Frank Langfitt took a tour and filed this report. ...And we kind of lost our way. UNIDENTIFIED MAN: I don't know. Where'd they go? DAN WINEY: We get lost in here, we'll never find our way out. LANGFITT: This is Dan Winey who oversees Asia-Pacific for Gensler. The building's interior is still a work in progress, so it can be a little confusing. We climb a couple more floors and catch up with the other architects. We come upon a giant steel box. WINEY: This is an amazing piece of engineering right here. LANGFITT: It weighs 12,000 tons and is surrounded by pistons. It's called a tuned-mass damper. Winey says it keeps the building from swaying in heavy winds. WINEY: Yes, to counterbalance - so what it essentially does is it dampens the movement of the building. LANGFITT: Without a damper, the top of the building could sway as much as five feet during typhoons. WINEY: If you don't have something like this in a building of this height, you can actually get nauseous. LANGFITT: How'd they get a 1,200-ton weight all the way up here? WINEY: It's actually steel plates that were brought up and stacked inside this box. So they're brought up by a crane and then stacked. LANGFITT: Shanghai Tower is so tall, only the Burj Khalifa in Dubai is taller right now. The views can be disorienting. From the observation deck, you look down hundreds of feet to another skyscraper that's taller than the empire state building. And when the air is clear, you can see a long way. Jun Xia is also an architect for Gensler. JUN XIA: From here, I can all the way see from this direction - you can see the ocean, the sea. LANGFITT: How far is that? LANGFITT: That's about 31 miles. Beyond its height, what distinguishes Shanghai tower is the architecture. As the building rises out of the city's financial district, it twists and tapers like a glass and steel geyser reaching for the sky. The structure's smooth, spiraling form also cuts the wind load. People here seem to like the way it looks. Jason Wang, who's 9, is sitting outside. He likes to draw and is sketching a nearby building. Jason arches his neck to look at Shanghai Tower. JASON WANG: (Through interpreter) It's pretty grand and a bit futuristic. Normally, the buildings we see here are just square-shaped. This one is rounded. It's pretty creative. LANGFITT: And inventive - Shanghai Tower is a building within a building. The interior, where offices and a hotel will be located, is a cylinder, wrapped in a skin of glass and steel which creates a series of atriums that run up the sides of the building. Back inside, we step into an atrium 12 stories tall with palm trees, granite benches and a panoramic view of the city. Xia explains. XIA: The sky lobby basically does a couple of things. Number one, it's really - we call it - created kind of vertical urban communities where people gathering, they sharing, they can meet. WINEY: You know, you have food service amenities. You might have cultural events. You might just have meeting places - places that people can go so they don't necessarily have to leave the building. LANGFITT: Could you build this building in the United States? WINEY: No. The answer is no. WINEY: 'Cause from an economic standpoint, it would never pencil out. LANGFITT: For instance, Dan Winey says, the building has 21 sky lobbies, mostly public space that can't be rented out to make money. Shanghai Tower Construction and Development Company, a state-owned enterprise built the structure for around $3 billion. Winey says the return on investment could be a long way off. WINEY: Most U.S. developers - in fact, I don't think there would be any U.S. developers that would be willing to make that kind of investment. LANGFITT: But Shanghai Tower isn't a conventional building. It's a statement - a symbol of China's economic rise. From the government's perspective, it's probably worth it. As for Shanghai Tower's reign as the world's second-tallest building - well, that won't last too long. Ping An Financial Center in the Southern Chinese city of Shenzhen will surpass it when it opens as expected next year. Frank Langfitt, NPR News, Shanghai. Transcript provided by NPR, Copyright NPR.